And so, after an evening drenched in the dramatic light sunset, we return to the room where everything began for a playful episode lacking in the variety and affect of the one prior. Where episode 18 covered the span of an entire evening, episode 19 is something more akin to a mere half hour. It’s comfortable, cozy, and just a tad bit awkward. All is all it should be, one might say. If there’s one overriding theme to this silly episode of banter, flirting, and teenage discomfort, it’s the exploration of a new stage in a relationship. 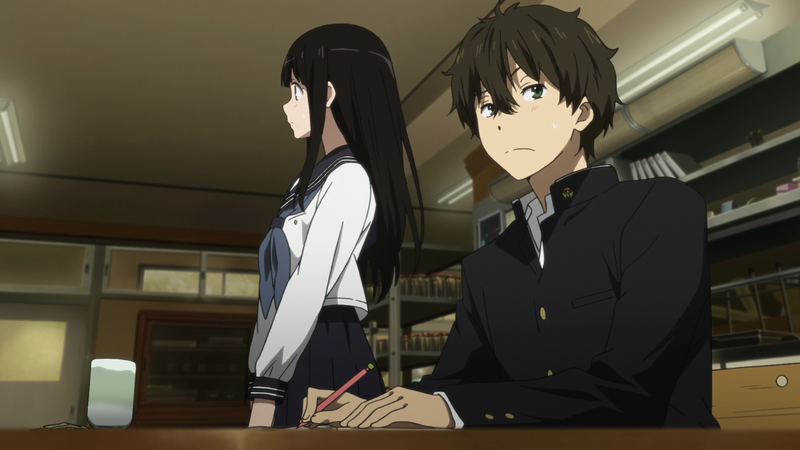 Throughout their game, Oreki and Chitanda are constantly pressing forward, pulling back, and dancing around the other. 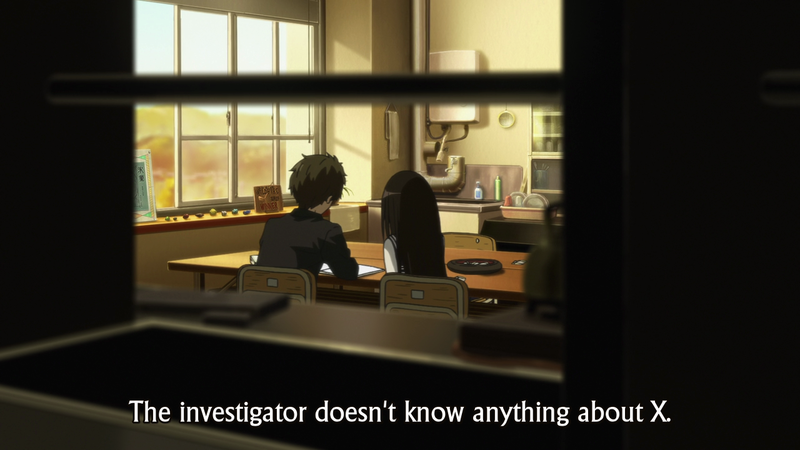 There’s a mystery at the center of it (and, of course, the irony is that Oreki solves it even as he is attempting to do the opposite—such is the burden of talent), but it is merely the maypole around which they spin. It’s adorable, and at times intense, to watch, and all the character work done in this episode is helped along by cinematography that consistently reinforces the subtext of this one long conversation. Much of this episode is done in parallel shots—when one of them moves, the other responds in kind. Of course, someone always has to make the first move, to step out, but once that’s done the wheels begin turning and the dance begins. 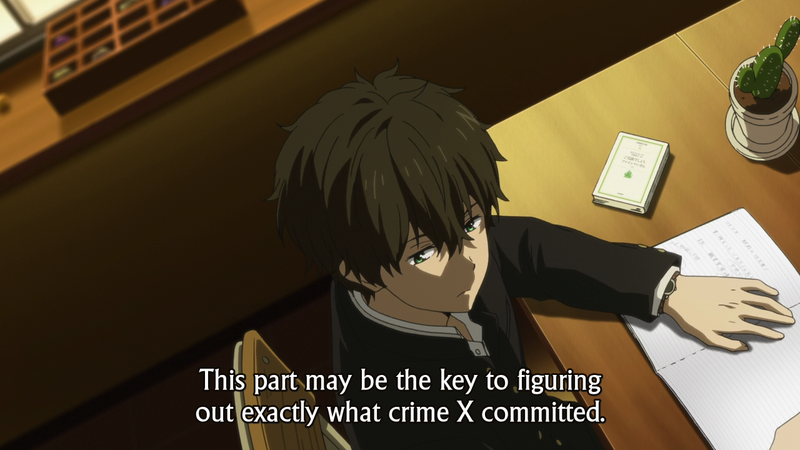 And, notice, it’s not even the game that begins things—even before Chitanda makes that suggestion (really, it’s a plot to get Oreki to engage, and man, does it work), they’re playing with each other. Chitanda reaches out to Oreki (1), the shot closes as he returns the banter (2), closes once more as she tries to pull him in further (3), and then zooms out as he stops the pattern (4). And so we pause, just for a moment—but there are forces pulling these two together. So, Oreki rengages, this time of his own volition. He thinks (1), thinks (2 – once again we zoom in), and then acts in a dynamic, almost aggressive shot (3). And, of course (of course she is) Chitanda is thrilled and her eyes light up (4) at the prospect of this kind of interaction with Oreki, the boy she finds so fascinated. And Oreki, now that he has made the choice to play the game—having pulled back, and then returned—takes a position of grandeur (5) in an overblown shot reminiscent of the lighting at the ends of episode 18, yet this time far removed in gravity from the significance of that defining moment. And yet, the callback isn’t entirely unjustified, because even as he’s messing around, this is still the same Oreki who proved he can be enchanting beyond his deductive prowess. That, then, becomes the base of common humanity which his playfulness this episode grounds itself in. You might even say that it enables this newfound type of playfulness, that in embracing the depth of other people he’s also found the ability to find joy in the frivolity of others as well. You might say that, at least. And so, when the opportunity comes, they’re equally engaged (3 and 4). The unusual use of the canted angle shots (1 and 2) allow both Oreki and Chitanda to fill most of the frame, and catches their respective forward body language as they more towards each other despite being seperated by the cinematographic cut. It’s simple, but effective—so plainly obvious is their unified interest in the game (and in each other) that no more complexity is needed. They speak for themselves, and the tightness of the close ups in the third and fourth shots again represents the closeness between them. It would be exhausting to detail every instance of this in-out-in pattern across the episode—but believe me, it’s there. Intimacy and distance, both playful and serious, pervade the episode. The playful stuff, as I’ve said already, is very nearly a dance. It’s the fluttering of two butterflies around the mystery flower, enjoying each other’s company and the thrill of the game while also, quietly, under the surface, feeling the realness of the relationship underneath the showmanship of the teasing. Because, as much as this is a game with no stakes, it’s also a game with immense gravity for both of them. For Oreki, it’s a sort of last defense against Chitanda’s insistent interest; and for Chitanda, it’s a chance to both see Oreki in action again and to validate her interest in him. Although it’s a game, she can’t help but take it seriously—because it’s him. 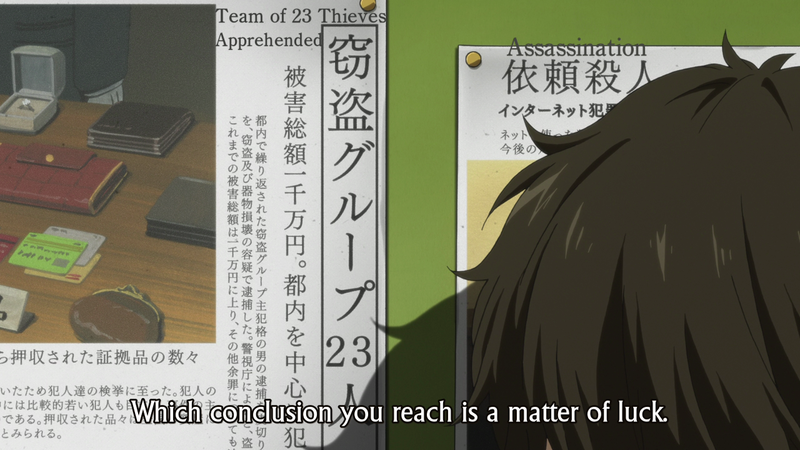 In parallel, although Oreki returns again and again to the refrain of “it’s just a game,” it’s more than that for him, too. Not because “winning” would prove his point—because it’s her. 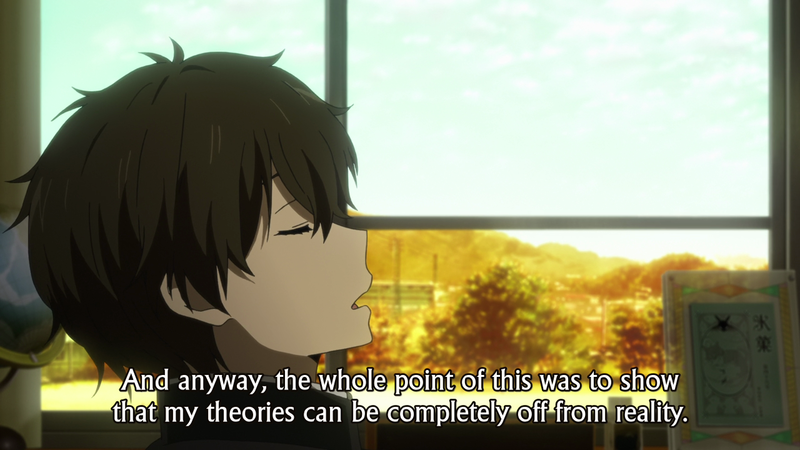 Oreki understands, but he’s alone in his conclusion. 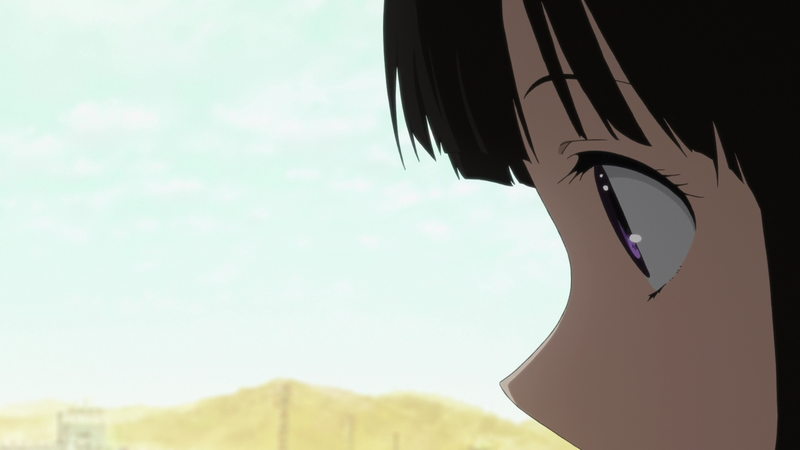 (2/3) …the point of connection—both for the mystery, and for Chitanda’s understanding. 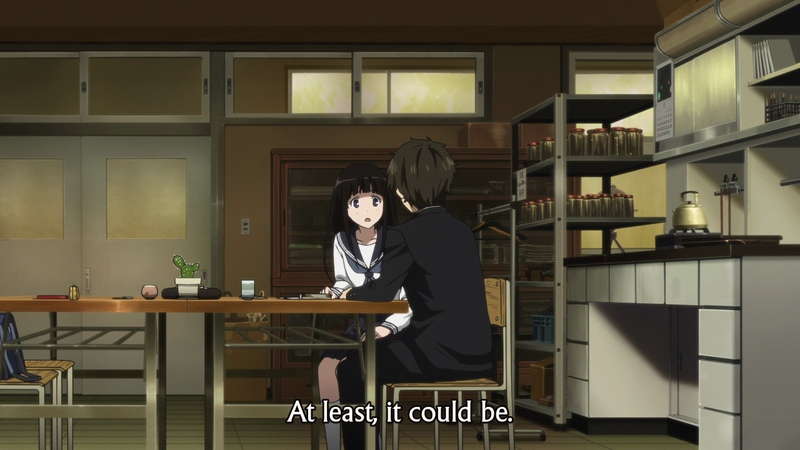 (3/3) And so, as Chitanda is drawn into the same understanding the Oreki is in a shot that parallels the first. Distance. Why? Because it’s not the answer she wanted. Her solution: to engage, to draw closer. And again we see the classic body language play out once again. Canted angle, her distress has got the whole thing off balance. And, again, she’s distant again. (1/2) And then, her emotions carry her in close. (2/2) So close that the shot becomes entirely claustrophobic. And these last three, I think, need no explaining. The rest, aside from the reprisal of a shot used earlier to relive the—yes, I’ll say it—romantic tension between them, carries itself along easily. 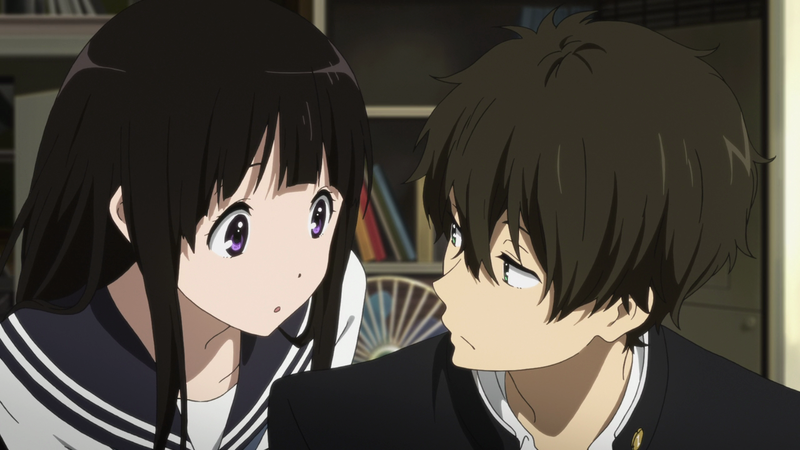 Oreki can’t remember why he started this whole endeavor, but its certain Chitanda does. And the final four shots in the classroom, in this place where these two have come to learn to love each other, allow Chitanda to make her small confession (1) and Oreki to finally accept his own feelings (4). 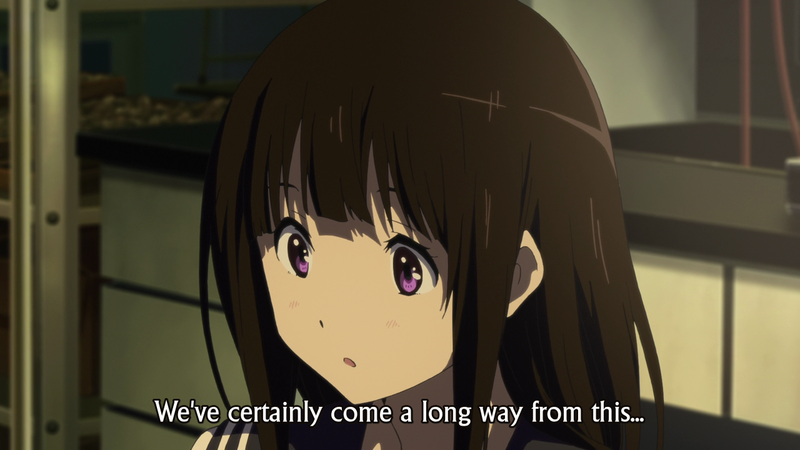 Indeed, they certainly have come a long, long way from where they started at the beginning of this show. One clue has lead to another—and look where we are now. 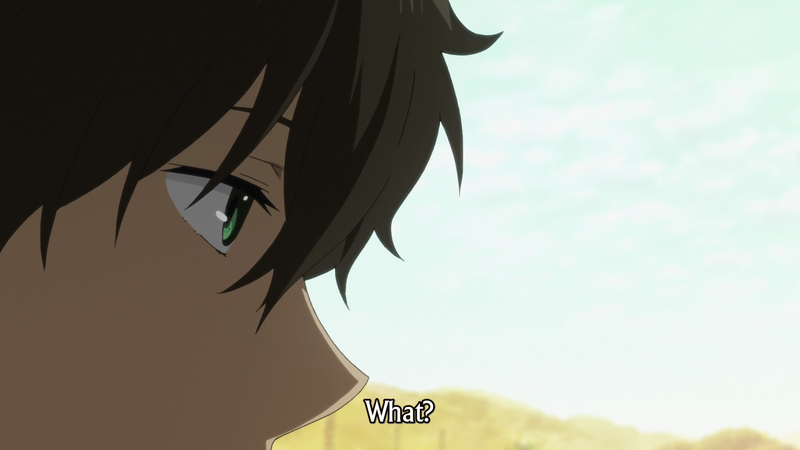 *Oreki taking the initiative to ask about her uncle’s funeral. It wraps up the first plot thread of the series, of course, but Chitanda’s later comment about them coming a long way bookends this scene quite nicely. 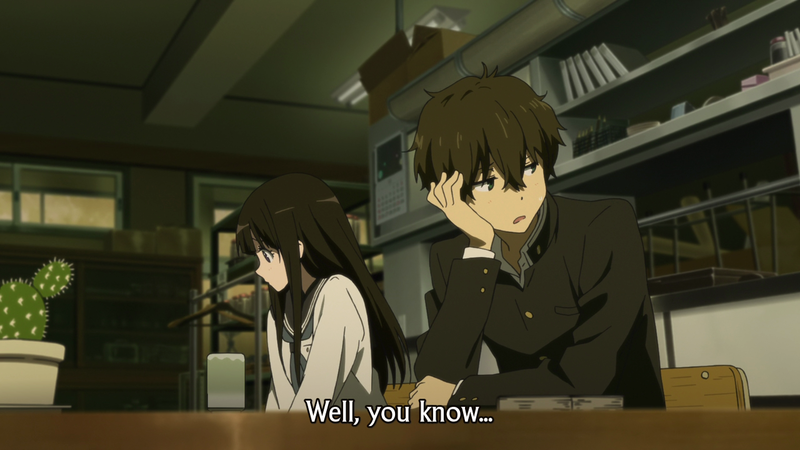 They’ve come a long way as friends from the first episode of the series when that mystery originally brought them together, while Oreki himself has come a long way from his old lazy/disengaged self to someone who’s actually starting conversations and asking people questions about important things in their lives. *The little noise Chitanda makes when she’s making the frustrated face you posted above the jump – too cute! 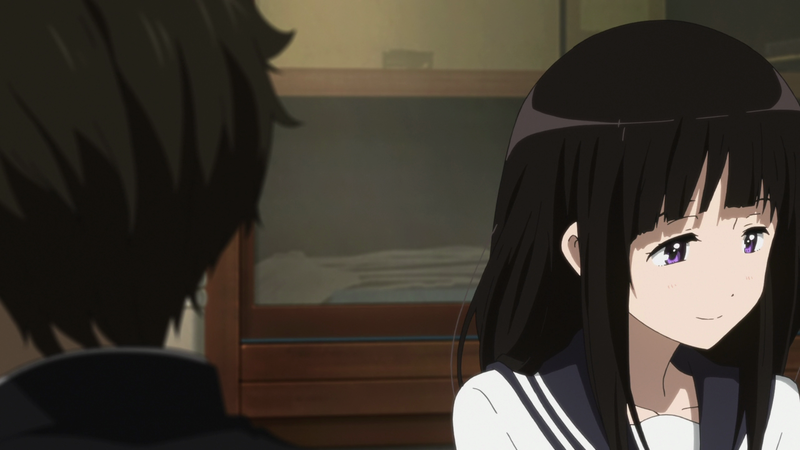 Also, Chitanda’s facial expressions in general. She shows a wider emotional range in this episode than we typically see from her, and besides the funny faces, I also really liked that silent scene after Oreki concludes his theory, where she’s just staring back and forth between him and the notebook. 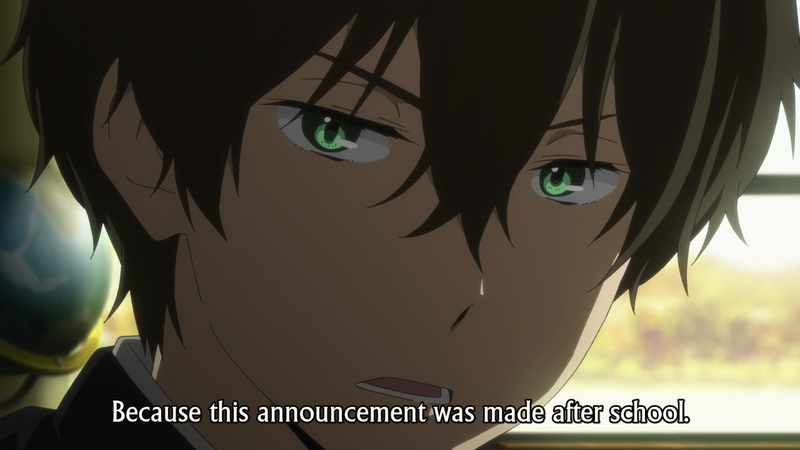 Most series probably would’ve had the girl shouting “Sugoi!” and giving us a speech about how talented he is, just to make absolutely sure the audience got the point about Oreki’s skills; Hyouka lets its silence do the talking instead. *The use of Bach’s “Air” from his “Orchestral Suite No. 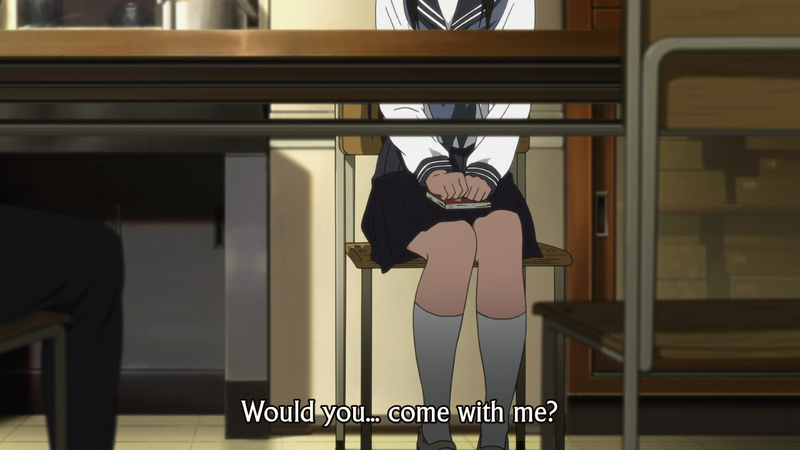 3” in the part where Chitanda gives her semi-confession. Given that “Air” is usually considered one of the most romantic pieces of classical music ever written, it’s both a nice underscore within the scene and another nice counterpoint to episode 1, when Oreki’s introductory speech about enjoying the grey life was accompanied by another Bach selection, the prelude to “Cello Suite No. 1”, a piece of music that definitely does not inspire romantic feelings. *The fact that the two of them can have a thoroughly enjoyable afternoon together just discussing ideas and theories like this. 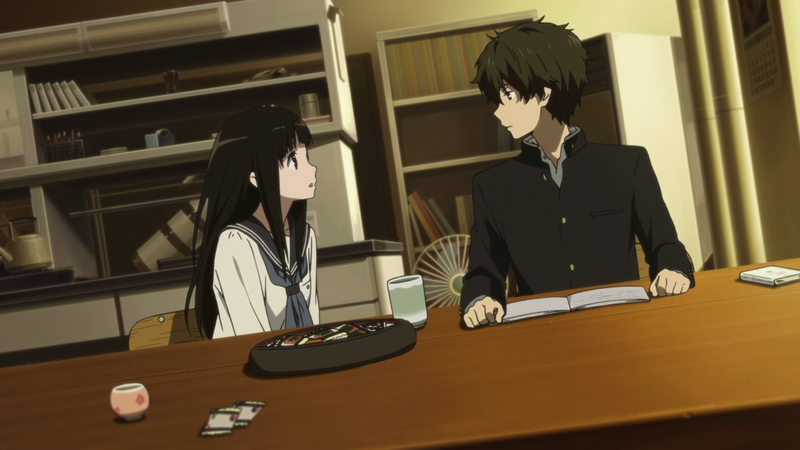 It’s clear that they’re both intuitive thinkers, with Chitanda’s intuition being heavily people-oriented and Oreki’s being heavily logic-oriented, and I know from experience that when two intuitives get on a roll together, they can go on for hours caught up in their own little world of games or puzzles or sharing ideas or whatever it is they’re enjoying. As an intuitive myself, it was a lot of fun both to watch and to recognize that very familiar dynamic playing out. We’ll see a small reprise of that in episode 22 when they share their theories about the bridge mystery (and I’ll have a lot more to say about that particular scene when it comes up). 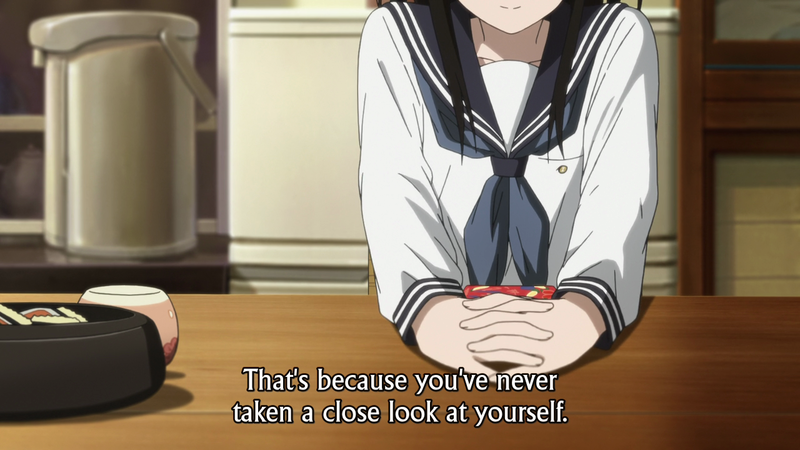 Yeah, this was a very good episode for Chitanda characterization. For someone who’s mostly been a motivator for Oreki, it was nice to see how much we just got to see of Chitanda being Chitanda—her mischievousness, her playfulness, her awkwardness, her seriousness—wonderful stuff. And, as you said, it’s a unique and special relationship of commonly shared interests and ways of thinking. Very neat stuff.